Rounded shoulders are a common problem nowadays that affect a lot of people. In fact, if you’re reading this, there’s a very good chance that you have rounded shoulders. Today we´ll learn how to fix rounded shoulders through stretching and exercise. It’ll take time to fix your shoulders, don´t expect to correct them just in a couple of sessions. Poor posture habits like looking at computers at work or at school, or looking down at smartphones and computer tablets. Any activity that causes the body to look down and forward for long periods of time can contribute to slumped shoulders. Over time this postural adaptation causes the muscles and fascia to get shorter in the front of the chest. 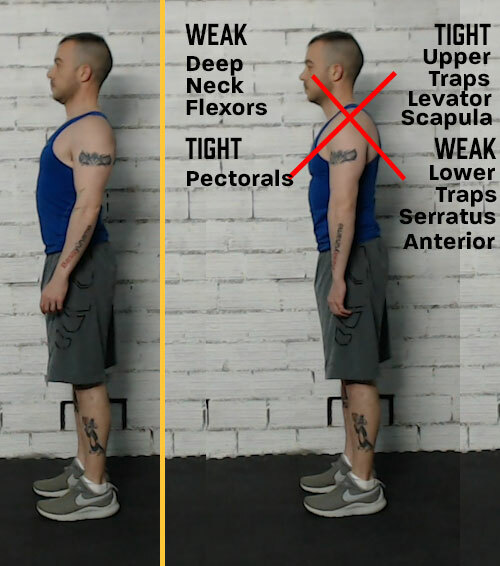 This continuous bad posture results in muscular imbalances between the muscles that pull the shoulders forward and the muscles that pull the shoulders backward. When we slouch, the shoulders roll forward and the neck follows suit, craning ahead of our bodies. This shortens the muscles of the chest and weakens the scapular (upper back) muscles, setting the stage for a hunchback appearance. Sleep posture can leave you achy if you’re not properly positioned. If you’re a side sleeper, use a pillow that keeps your spine aligned by supporting your head so that your neck isn’t held at an awkward angle. Also, when you lie on your side, your top knee drops, pulling down on your back, so place a pillow between your knees to stay aligned. Focusing too much on certain exercises: the most popular exercise in the weight room is the bench press. Those whose workouts focus on the bench press at the expense of other muscle groups are susceptible to having rounded shoulders due to the overdevelopment of the pectorals and the anterior (front) deltoids, muscle groups that when they contract can pull the shoulders forward. while neglecting the upper back. Besides presenting an unhealthy appearance, there are many serious medical conditions that can result from having rounded shoulders. In the short-term, round shoulders cause chronic tension on the infraspinatus and teres minor, making these muscles more susceptible to injury. Another characteristic of round shoulders is decreased mobility in the shoulders, increasing the risk of shoulder impingement and even dislocations. In the long-term misalignment of the cervical spine increases the risk of osteoporosis and disk degeneration (cervical osteoarthritis). Stretch the muscles that are tight and to strengthen those that are weak will help correct rounded shoulders. Stand up in normal posture in front of a mirror. Keep your arms relaxed by your side. If your palms are facing backward it may indicate that you have a tight chest and a weak upper back. It is important that we first release tight muscles to enable the shoulders to be re-positioned correctly. If you have completed all of the above exercises, your shoulders should be feeling much more flexible. Now, you need to strengthen the muscles to keep your shoulders in the correct posture. Perform 3 sets of 12-15 repetitions of each exercise. Rest one minute between sets. Now that you know the formula for how to fix rounded shoulders, remember that it can take time to correct them. Just as rounding them didn’t happen overnight, it will likely take some time to correct them. Any questions? Leave me a comment down below. Many of us spend on average 8+ hours sitting at our desks, traveling in planes, trains, and automobiles or on the couch; top that off with another 6-8 hours sleeping. That can add up to nearly 20 hours of sedentary sludge. Sitting invites stagnation and our fascia (the material protecting and supporting our body as a unit) begins to reshape so we start to take on the shape of our chairs. Our hips become tight, ankle movement diminishes, our shoulders push forward, we forget to engage our core as we slouch and collapse our lower back, and our necks crank towards the screen. 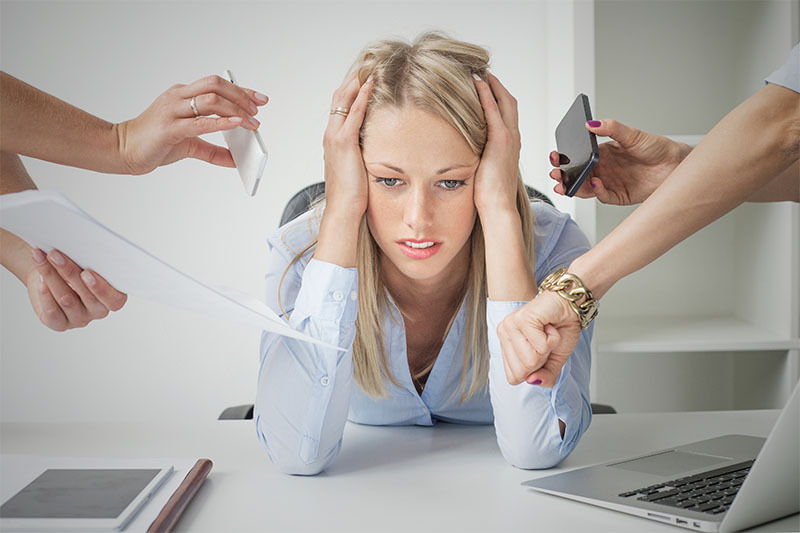 It can be challenging finding time to fit in errands, work, kids, home, exercise and the million other things to get done in a day. Time is the biggest barrier to an active lifestyle. Remove the expectation that the only way to get in shape is by going to the gym for an hour every day. This time commitment is simply not realistic for most of us. Walk while talking on the phone or conduct walking meetings. Take stairs instead of escalators and elevators. Park in spaces furthest from the entrance. Use restrooms on a different floor or furthest from you. Use half or all of your lunch hour to take a walk with a colleague. Steve Jobs was at his most creative while walking and thinking outside in the park next to his office, and we can be, too. Apple’s founder knew that the body and mind respond to nature and to moving. Put on some good music and dance while cleaning the house! Make a commitment to move at every opportunity, stand whenever you can! The Department of Health and Human Services also recommends strength training exercises for all major muscle groups at least two times a week. Studies have shown strength training to increase lean body mass, decrease fat mass, and increase resting metabolic rate. Weight training has also been shown to help fight osteoporosis. The American Heart Association recommends that healthy adults engage in flexibility training two to three days per week, stretching major muscle and tendon groups. I know all this exercise seems a lot from the point of view of busy people, but all of it only takes one hour, 4% of your day. Remember, you can break up your activity into smaller bursts. If your job keeps you moving all day long, activity trackers (apps or wearables) are the simplest option to keep track of it. Forget daily steps and aim for at least 30 minutes of brisk walking. You do so, daily aerobic exercise is done. Stretching your legs and back when you are on your desk. Using a door frame or anything sturdy to stretch your chest. These stretches will reduce the negative effects that sitting has on your body. It also improves one’s quality of life. Find an exercise schedule and activities that work for you so that you stay fit and healthy. Once you learn to make time – and it doesn’t have to be a monumental commitment – the benefits will outweigh any desire you may have had to sacrifice your health by staying on the sidelines. Keep in mind that it is possible to get all the exercise you need without using equipment, attending a class or going to the gym. The most important key is to change the mindset. Exercise shouldn’t be a chore. It should be time for you. Don’t be afraid to make time for yourself. You are worth it! Do you need help to achieve your fitness goals? I still have some available spots. Running, jumping rope, box jumps, burpees… they can all lead to shin splints, a painful and incredibly annoying injury experienced by almost every single active person ever. Shin splints are often caused by inflammation of the sheath surrounding the tibia bone. Foam rolling can help release this inflammation (but don’t do this exercise if your shin splints are due to stress fractures). Read the main instructions on how to foam rolling, here. Tight hamstrings are a common issue among all kind of athletes, no matter the sport. Even non-athletes suffer from tight hamstrings, especially professionals who sit for extended periods of time. Foam rolling the hamstrings is an effective solution for this problem. Stretching may be more beneficial if foam rolling is done prior to the stretch. A study from 2014, Foam Rolling and Static Stretching on Passive Hip Flexion Range of Motion, measures the effects of foam rolling prior to static stretching. The authors found an increase in the hip range of motion after rolling on the hamstring then stretching, compared to stretching alone. In my experience, tight hamstrings cause lower back pain. Countless times the pain is gone once I take care of my hamstrings. As foam rolling the lower back is something we should NOT do, loosen up your hamstrings is an indirect way to relieve pain and tightness in the lower back area.